25.10.2013 | CISC announcement highlights ANZ meeting. The following is a translation of a CISC announcement in relation to Asia Iron Australia’s Extension Hill Magnetite Project. 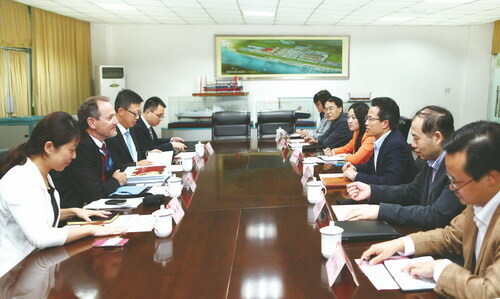 “On 17th October 2013, Mr Liu Jiacai, President and Party Secretary of Chongqing Iron and Steel Company (CSIC), Mr Yuan Jinfu, Vice-General Manager and CFO of CISC, met with ANZ Banking Group guests lead by Mr Jonathan Bloch, General Manager of Mineral Resources. During the meeting, Mr Liu warmly welcomed the guests and thanked ANZ for its interest in CISC’s Australian iron project. He expressed the hope that through increased communications with ANZ, during the advancement of the project ANZ would be able to provide help, advice and recommendations as well as increasing the scope of mutual cooperation. Mr Bloch said the CISC Australian iron project is a good project which deserves attention and cooperation. He provided comments and advice on the advancement of the project, and indicated that in a suitable manner they would cooperate on the project and provide high quality financing solutions.